A noted novelist of more than 70 books, Barr was born in England in 1831. She married Robert Barr in 1850. They moved to America with their children and settled in Austin, Texas, where Barr became secretary to General Sam Houston. In 1867, her husband and two sons died of yellow fever. Moving to New York with her three daughters, $5, and faith in God, she started a new life. 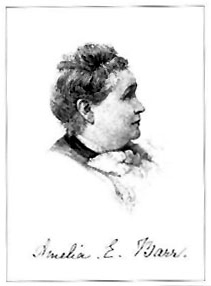 After struggling for years, in 1884, at the age of 53, she published her first novel, Jan Vedder's Wife, which was an immediate success. In her later years and still prolific, she moved to Richmond Hill, NY in 1914. She died in 1919. A great advocate of Women's Rights, she was one of the earliest activists who campaigned for equal pay for women who performed equal jobs as men. Amelia Huddleston was born in Yorkshire England, lived in Scotland with her husband John Barr, and after his bankruptcy went to New York. From there they went to Chicago and finally Texas, where she survived the Galveston hurricane. She moved to New York and began writing for publication in about 1870, writing poems, essays, and novels. Of her 42 published novels, she is best remembered today for Remember the Alamo. We hear voices in solitude we never hear in the hurry and turmoil of life; we receive comforts and counsels we get under no other condition.